A good garage door will last for a decade or more. The better you maintain it, the longer it will last, especially if it’s a quality door to begin with. However, no door is going to last a lifetime, and eventually, most homeowners are going to have to face the prospect of new garage door installation. But how do you know it’s time? What are the signs you should look for that it’s time to replace your old garage door? Our Boston-area garage door installation team has been working with homeowners in the area for years, getting them the right garage doors at the right price, and here are some of the things we tell homeowners to watch for before they call our installation team. Your door is showing signs of major wear and tear. All good garage doors eventually end their battle with time! Signs of serious wear and tear like cracks that are more than surface deep, rot at the bottom, or warped edges are all signed it’s time to replace the door. Not only do these things have a negative impact on the value of your home, they could be a safety issue. Damage to the garage door can cause it to move off of its rails or get stuck. You are repairing the door more than using it. Have you been calling our garage door repair team more than you’ve been opening and closing your garage door? That’s a sure sign it is time for a new garage door installation. 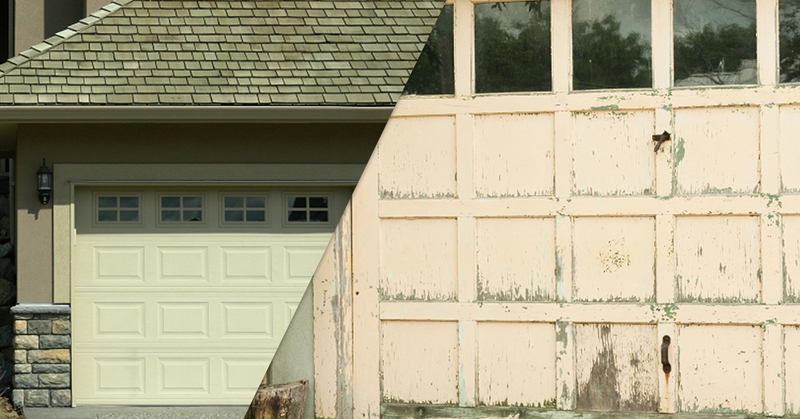 As garage doors get older, they are going to require more and more upkeep. While we can continue to patch up and repair your garage door, at some point it simply becomes more cost effective and efficient to replace it with a new one. It hasn’t been replaced in at least two decades. If the door on your garage has been there since the Reagan administration, you might want to think about replacing it. That’s because today’s garage doors are much more energy efficient than their predecessors from 20 or more years ago. You might find that replacing your garage door means you are paying less each month to heat your home. Older doors are usually much heavier, too, making them harder on automatic openers and your back. You want to upgrade the tech or quality of the door. There are a lot of cool features on today’s garage doors that can help you keep your home safer and more secure. If you’ve been wanting to utilize those features but your old garage door just won’t deliver, then it’s time to upgrade your door. You might also want to upgrade it due to improving the quality of your door in general. If previous homeowners installed a low-quality door that’s not meeting your need, it’s time for new installation. Replacing the door would increase the resale value of your home. Your garage door plays a big role in your curb appeal, which directly affects the value of your home. If your home is suffering from a lack of curb appeal, you aren’t going to get the maximum value out of it when you want to sell. Replacing your garage door can be a smart first step to making your home look more appealing. You’ll probably get the value out of the installation in resale value! Looking for garage door installation in Boston? Get in touch with us today!